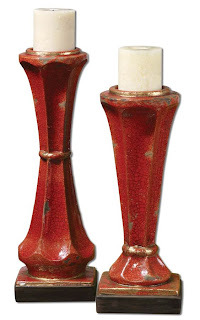 Add a pop of color to any table with this fabulous Uttermost Rohini Red Ceramic Candleholder Set. We love the Tuscan look of these candleholders! The rustic set of 2 candleholders features a distressed, crackled, faded red ceramic with antiqued khaki undertones and gold accents. The cream candles are included. For more details visit www.cheapchicdecor.com.